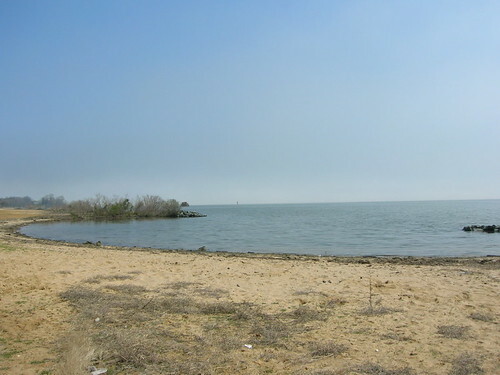 Aquia Landing was the site of the first Roman Catholic Settlement established by Giles Brent and his sisters. It became instrumental during the American Civil War (Goolrick 13). Rail access was very important for transportation in the early eighteenth century. Aquia Landing became one such place. Because it was deeper at points than the Potomac River, it was decided that Aquia should become a terminus point for the Richmond, Fredericksburg, and Potomac Railroad, or RF&P (Eby 26). Steamships began operating there in the year 1842 (92). During the Civil War, Confedera te soldiers took steps to secure Aquia Landing because, if captured, it would become a vital shipping port for Union supplies. The first shots of the Union Navy were fired here when they attempted to take the terminal on May 31, 1861. Three successive attempts to take the terminal occurred within days of each other, all unsuccessful. The first use of torpedoes was here. Confederate soldiers secured explosives to two barrels, lit them, and sent them out across the creek towards the Union boats. This attempt was unsuccessful, though, because the fuse got wet, so it was unable to do any damage (92). In an attempt to protect Aquia Landing, the wharf, surrounding buildings, and bridges at Accakeek Creek, Potomac Creek, and the Rappahannock River were all burned by Confederate soldiers. South of the terminal, several miles of railroad tracks were removed, and the ties were burned (93). Without an available supply line, Union soldiers could go no further than the Rappahannock River. The Union immediately appointed Herman Haupt, an engineer, to rebuild the tracks. Working in 24-hour shifts, a crew of experienced railway workers and soldiers laid the three miles of destroyed tracks in only three days. This was quite the accomplishment because the previous set of tracks took almost a year to complete. The speed with which the work was completed shows how essential securing Aquia Landing was to the Union. The bridges were restored as well. Historians believe that the structure of the bridge crossing the Potomac River contains bricks and stones taken from Potomac Church. By restoring the bridges and railroad, Union troops were able to push deeper into the south. The facilities, bridges, and rails were burned and restored several times during the Civil War. The rails were repaired a final time in May 1864, but were left in horrible condition. The facilities were not restored. A new supply line between Fredericksburg and Quantico was opened in October 1872; therefore, Aquia Landing was no longer important as a supply line (95). “Aquia Landing,” Courtesy of Amy Benjamin, 2008. 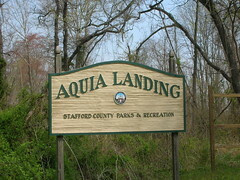 “Aquia Landing sign,” Courtesy of Amy Benjamin, 2008. Eby, Jerrilynn. They Called Stafford Home: The Development of Stafford County, Virginia, from 1600 until 1865. Bowie, MD: Heritage Books, Inc., 1997. This entry was posted in 1600s, 1800s, Civil War, Conflict Sites, Early Settlement, Jennifer, Location, Stafford and tagged Aquia Landing, Confederate Army, Rappahannock River, Stafford, supply line, Union Army on March 10, 2008 by jlfeldhaus.